"Helping our scholars to reach for the stars and beyond!" 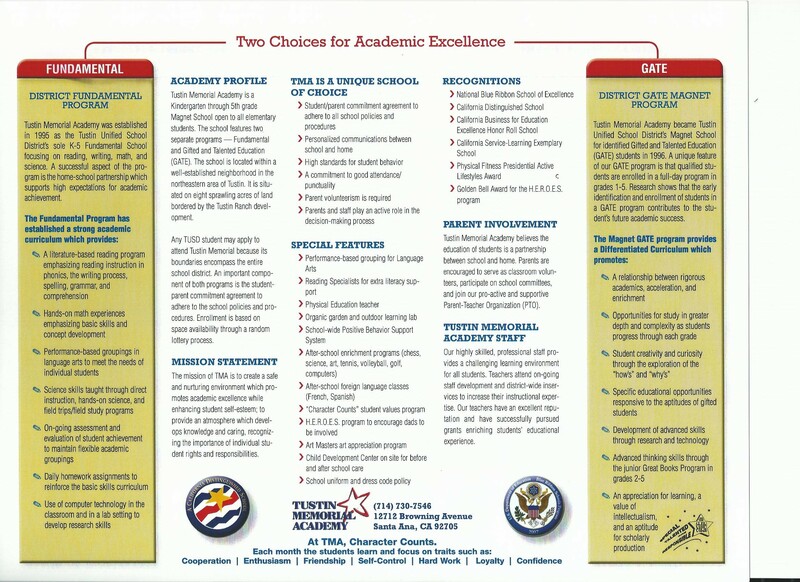 Tustin Memorial Academy is Tustin Unified School District's GATE Magnet School. There are 3 main programs at a TMA, a Fundamental program for students in grades K-5, an APL (Advanced Primary Learner) program for students in grades 1-2, and a GATE (Gifted and Talented Education) program for students in grades 3-5. ALL students, regardless of program, are provided with a meaningful experience that focuses on developing the well-rounded individual and higher level thinking skills. Teaching strategies and opportunities that promote critical thinking, collaboration, creativity, and communication are at the center of the learning for all TMA scholars. Identified APL and GATE students are provided with challenging learning opportunities in a full classroom/self-contained setting, which is a unique feature of the school. The Magnet APL and GATE Programs provide a Differentiated Curriculum that promotes opportunities for study in greater depth and complexity, development of advanced skills through research and technology, growth in creativity and curiosity, and an appreciation for learning. STEAM (Science, Technology, Engineering, Arts, Mathematics), Visual and Performing Arts, Balanced Literacy, CGI Math, and hands-on social studies continue to drive the curriculum and instruction for the entire school, along with our school wide focus on Growth Mindset. Our new iTeam Headquarters Innovation Lab serves as an exciting place to collaborate and think creatively, and our TMA Garden provides an amazing outdoor learning lab opportunity for all students to experience throughout the year. Tustin Memorial Academy encourages strong parental involvement with a collaborative relationship between staff and parents. This creates a unique and dynamic experience for our students. Please reference the attached brochure for additional information.